Alfa Romeo would like you to buy a 159 instead of one its German rivals, and on paper it isn&apos;t always clear why you should. The 2011 has no six-cylinder option, the electrical system is questionable and the resale values are so low that they don&apos;t even seem possible. The price offers the only real on-paper advantage over its rivals. The Alfa is cheaper than the cars coming out of Munich, Ingolstadt or Stuttgart; and far more comes as standard than would with a BMW, Audi or Mercedes. Normally we would tell you that to get a deeper appreciation for an Alfa you would have to drive it. In this case, we would still advise driving the 159, but one big advantage of the 159 can been seen even when you&apos;re just standing next to it. 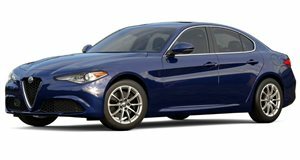 The Alfa (and this should come as no surprise to anybody even remotely familiar with the brand) is far better looking than its rivals from every possible angle, and this is not because those rivals are ugly, the Alfa is just that good. The Alfa will also say much better things about you as a person. A BMW 3-series is really just a badge-delivery system, four wheels to cart around the owner&apos;s electronic toys, ego and Bluetooth earpiece. At least, that&apos;s how people will see it. A recent survey showed that UK drivers consider BMW drivers to be the angriest on the road, with Audi in a close second. With the big grin you&apos;ll have plastered to your face while driving the 159, there&apos;s very little chance anyone will think you&apos;re angry. There are five engines available, three diesel and two gasoline, and the highest powered in both categories are putting out 200 horsepower. That&apos;s a respectable but hardly fantastic amount of power, considering some rivals can offer 100 more than that. None of that matters once you drive the car though, in fact, nothing much in the world seems too matter quite as much behind the wheel. I&apos;m a big fan of German cars, but they are a different kind of experience. Driving a 3-Series has always been a sort of disconnected experience, and the A4 only slightly less so. They&apos;re very capable cars, but they lack the feel of an Alfa. Part of this is due to a suspension setup that is a bit stiffer than you would expect to find in a car in this segment. This is great on twisty but smooth roads, but if your daily commute features a large number of potholes, it can be a bit much. All of that rattling around won&apos;t be as big a problem as it has been in previous Alfas. Build quality might not be up to a German level, but it is still much improved. All told, you would buy the Alfa for the same reasons that would have put you behind the wheel of any other Alfa Romeo, they look great and are fun to drive.